Protein shakes are a good addition to a healthy and varied diet. However, there is quite a difference in price / performance ratio between the different brands. The Myprotein Impact Whey is a protein shake which is becoming increasingly popular among professional athletes, but is this justified? I was able to test the product and will explain my thoughts in this review. Check out our MyProtein Discount Code page for our latest deals and exclusive offers. The first point of the review is the solubility of the product. With a protein shake that you use every day (some even take several shakes per day), it is important that the powder dissolves well in water or milk. It can be difficult to consume when large lumps or pieces remain in your shake because the protein powder did not mix well. According to Myprotein, you mix 25 grams of powder with 150 – 250ml of water or milk. The less water or milk you add to the powder, the thicker the shake becomes. After testing the product with both water and milk, I found that the solubility of Impact Whey is actually very good! This shake mixes well with both water and milk and no lumps remain. However, I noticed that when a 150ml milk was mixed with the powder, one or two small lumps formed which remained on the edge of my shaker cup. Anyway, this was only a few times, and personally I did not really mind this. Myprotein’s Impact Whey is available in over 15 flavours including: Chocolate Brownie, Cookies and Cream, Mocha, Pumpkin Pie and Rocky Road. Of course the “normal variants” as banana, strawberry, vanilla and chocolate are available. I personally tried the Chocolate Brownie and Rocky Road. My favourite has to be the chocolate brownie flavour. I must say that it is very tasty! Especially in milk you get a delicious creamy chocolate brownie milkshake. In water, the taste is a little bit less satisfying, but that’s all protein shakes. How much does this protein shake cost from Myprotein? Another important aspect when buying supplements is the price. Of course with the number of brands in the market selling protein, you want to find a product that does not compromise quality for price. That’s why in this review I’ll compare it with other top selling protein shakes in the country. 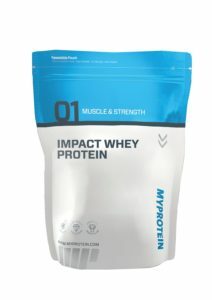 Impact Whey of Myprotein is available in bags of 2.2lb, 5.5lb and 11lb. One dose consists of a scoop of 25 grams, a bag of 1000 grams you will get 40 shakes. A bag of 5.5lb gives you 100 protein shakes and a bag of 11lb grams is enough for 200 Impact Whey protein shakes. When we look at the bag of 5.5lb, you pay per shake converted about 35 cents per shake. That is really cheap! Mind you, the dosage of 25 grams is often somewhat smaller than other protein shakes so to determine the real price you have to compare the amount of good quality proteins in your shake. While it is difficult to compare the products as each protein shake comes in a different size, a different dosage and composed of different ingredients, it is clear to see that MyProtein is the best value for money. In short, my experience with Impact Whey is very good. The taste is delicious, the price is really low and the nutrition composition of the product is good. The great benefits are in my eyes the very competitive price and the variety of available flavours to suit your taste. There might be brands with greater protein percentage than the Impact Whey, but fortunately there is nothing wrong with the composition of the protein in its amino acid profile and the intake can be adapted to meet your daily requirement. I would definitely use again and will writing further reviews as new flavours are introduced. Coupon Code – Any Flavored 11lb Impact Whey Protein for $49.99! At the beginning of my Impact Whey review I promised to include a coupon code worth 10% – 20% depending on the product. Go through the order on Myprotein and use the code above during the checkout of your order and get the discount on the Impact Whey Protein! Offer valid only for limited time as part of flash sale!